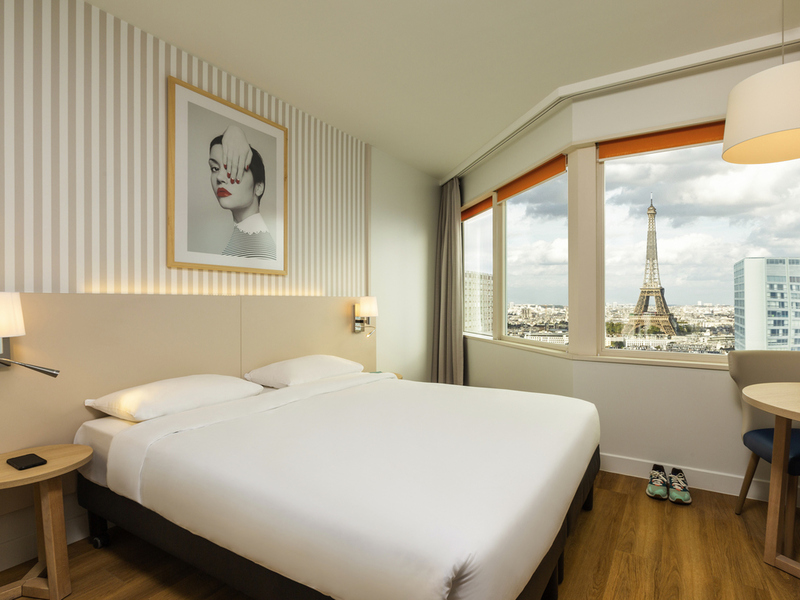 On the banks of the Seine and just steps from the Eiffel Tower, the Adagio Paris Eiffel Tower 2 features a breathtaking panoramic view of Paris and its most beautiful monuments. Rated a 4-star holiday residence, the Aparthotel is ideally situated for living life like a true Parisian and has 375 luxury apartments, ranging from studios for 2 people to 3-room apartments for 6 people. It also has an enclosed private car park, fitness room and 2 large meeting rooms. The Adagio Paris Tour Eiffel is located on the banks of the Seine in the heat of the 15th district of Paris. This aparthotel is a short walk from the Eiffel Tower close to the Bir-Hakeim and Charles Michel metro stop. It is idealy situated to visit main monuments and attractions of Paris including the Champs de Mars, Champs-Elysees and museums. Travellers can experience the Parisian life in the comfort of a hotel which offers a variety of amenities for a long weekend or business trip. 1-room apartment for 4 people - View of the Eiffel Tower. Cleanliness was lacking and bed was uncomfortable. The room wad not clean and the bed was quite uncomfortable. Affordable and spacious serviced apartment for families within an easy walk to Eiffel Tower, boat cruises, hop on hop off bus, airport bus, subway and shopping mall but not in the best looking street. Ibi is a wonderful, helpful employee. Our hotel room was fine - no frills, but clean and comfortable. The bathtub was great. While other employees weren't very helpful and were sometimes curt or dismissive, Ibi was wonderful, kind, helpful, and a delight. She should be commended at every opportunity for her incredible customer service, support, and care. EVERYTHING WAS NICE AND THE HOTEL IS VERY CLOSE TO METRO STATION. THE VIEW FROM OUR ROOM WAS PERFECT. WE STAYED AT 29 FLOOR AND WE HAD IN FRONT OF US THE TOWER EIFFEL. IN RECEPTION EVERYONE WAS VERY KIND BUT THE MOST OF ALL WAS MR JACQUES, A VERY NICE AND HELPFULL PERSON. THANKS AGAIN FOR EVERYTHING!!!!! The staff of the hotel was the only best part of the hotel.I stayed in room 1903 from 26th March to 2nd April.I stayed with my family and 4 year old son.The purpose of staying in apartment hotel was to have the comfort of home.The furniture of the room was broken and worn off and also the paint on the walls.It felt that there has been zero maintenance since the hotel was built.The floor was creaky.The airconditioner barely worked.The breakfast included in the package was below expectation.It was repeated menu for six days.It was my first and last stay in Adagio Aparthotels. The hotel room was very expensive and it was in a very poor state : every furniture was chipped, there were holes in wall, it was dirty: the floor was sticky, the sockets weren't working. Bad maintenance and poor cleaning : I saw an employee clean the common area, they just don't know how to clean. The first-time experience was excellent. The accommodations was very good. The check in process was easy. My experience at this property was lessthan satisfying. The pool was “experiencing technical issues”, the plumbing was terrible, it was hit or miss with the staff and quality or level of customer service but some of the room features are nice. Good: location, clean room and bath, quiet at night. Fast checkout. Unsatisfactory: Breakfast is understaffed, although doing their best, they cannot cope with the amount of people. Food on floor, tables not cleaned. Two more people would be of great help. Check-in process is extremely long. Nice place, but had problems. The lobby was really nice, but construction outside made the place look seedy. (Not their fault) We were upgraded to a 2 bedroom apartment which was spacious, but no view of the Eiffel Tower or Seine as promoted. One elevator would not go to top floor. Nice bathrooms, but bring your own shampoo, hair dryer, etc. The surface area of the one bedroom apartment should be more than adequate had it not been badly shaped. The furniture woul have been satisfactury hadit been new and comfortable. The entrance and the reception area could have been arranged for easier access. With remodelling this building can easily move up afew notches in rating. 10 minutes to Eiffel Tower - perfect! Contemporary superior studio, kitchenette with dishwasher, microwave & frij. Spacious, room had view of The Seine & close proximity to shops, metro and Monoprix (convenience store). Renovations are looking good. Staff were helpful although not all were as knowledgeable about tour bookings. Nice to have a basket of fresh free pastries in the afternoon. We were upgraded to the last floor which had an amazing view, however it seemed like the rooms wasn’t fresh enough... the carpet looked a bit old and I really didn’t like the fact that we could not open the window to get a bit of fresh air. Staff at the reception were very helpful. Freezing for the first night (5 degree Celsius) as the heater is out of order; Report the heater is out of order to the reception the following day (2nd day) but nothing happened/fixed; freezing again for the 2nd night; Cleaner broke into our room without knocking the door around noon on the 3rd day, while I was having a shower and the cleaner shocked my wife; On the last day when we check out we were told to leave our luggage at lockers on 1st floor but they were already full (around noon). I report this to the reception regarding the situation but they shouted at me saying that this is impossible. End up when my wife wants to use the toilet, they locked the one on the ground floor and asked her to use the one on 1st floor. End up the one on 2nd floor were closed as well. She were told to go to 5 different floors for a toilet but unsuccessful. We complained about this and the receptionist shouted at us again saying this is impossible. everything was clean good location and view rooms so hot with no windows that can be oppened this is the only pb.